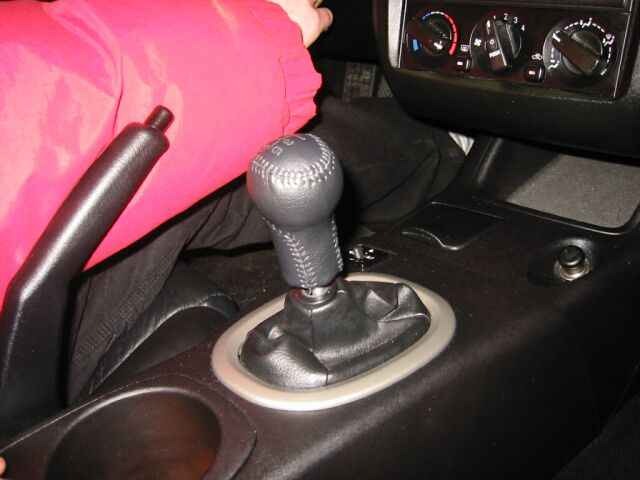 Okay you have a RPW shifter and congratulations. This product will completely change the way your car drives and changes gears to the point you don't know how you got along without it before. The car will change gears smoother, faster and with less chances of grinding the syncrho's. If you can get as good as David from RPW, you can go straight from 2nd to 3rd gear on a straight diagonal shift with no crunching. Takes some practice but can be done. Below is a guide to installing this kit into your vehicle. We will try to be as specific as we can with detailed photos. RPW takes no responsibility for this guide and is not liable for any wrong fittings, accidents and anything relating to this information. Any reference to this information is done at the users own risk. 1. 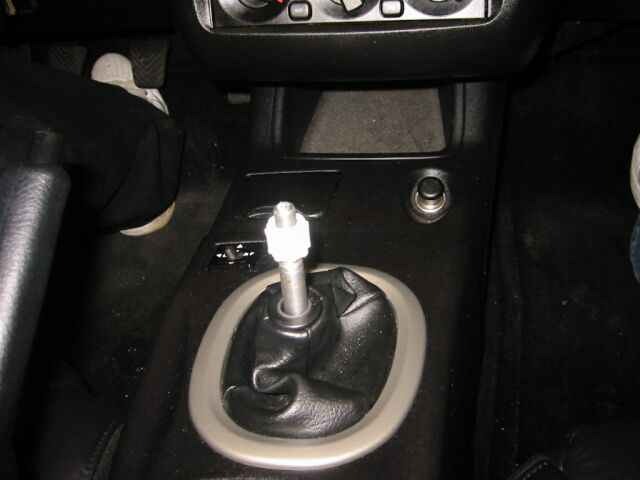 Once you have removed the gear knob - on the lancer mirage models you will need to loosen the centre console face. This is the unit that holds your stereo and other dials etc. Loosen this unit but it is not necessary to remove the whole unit away. 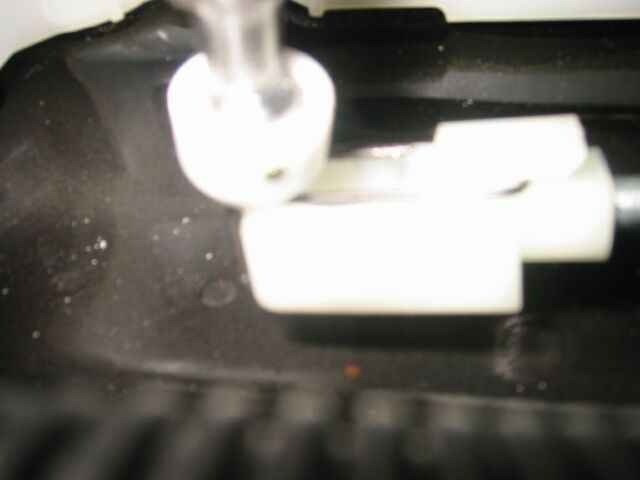 Loosen to allow access to the base of this plate. 2. Go to rear of centre console and remove two phillips screws at base of unit. Again place in safe container. 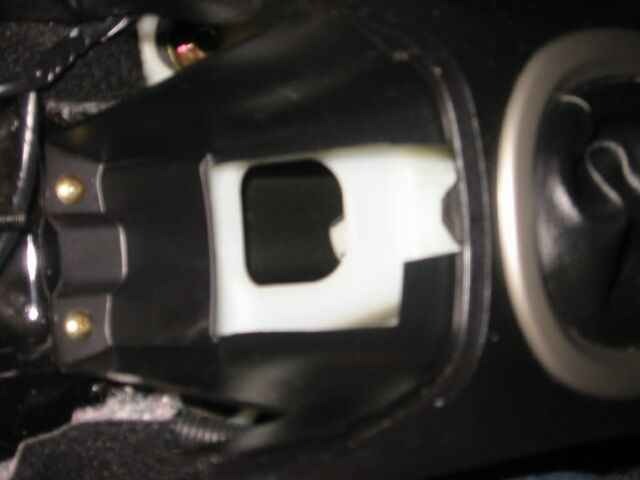 The rear section of the centre console should now be able to be removed as there are only plastic lock tabs holding it into the front section of the centre console. 3. Once rear section is removed, there are two more phillip screws at the rear of the middle base. Unscrew and place in safe container. 4. Once all screws are removed life centre console up and out of the way - be carefuel to ensure the shifter bag is lifted properly out the way at the same time. 2. Using either large pliers or long slot screwdriver - remove large metal clips from front of the shifter which lock down the cables onto the base of the shifter. Warning - these are usually very hard to remove and will take several goes. 3. Using ratchet and 10mm socket and extension remove the four bolts holding base of shifter down. Again place screws in safe location. 4. Now again using needle nose pliers, lift shifter up and the centre cable should still be attached. This holds a U shaped clip that locks the ball of the main shaft into a square clip. With easy access now to clip, lever aside the metal prongs till the ball joint pops out. This can sometimes be levered off without pushing aside the metal prongs. This clip can sometimes act like a spring and go "PING" and disappear so be careful as without it your not driving anywhere. Again if removed place in safe container. 5. 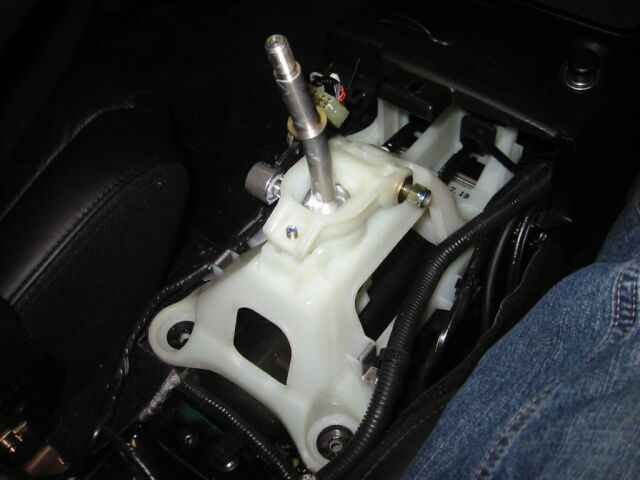 You should now have the stock shifter in your hand and removed from the vehicle. 6. From here assembly should be the reverse of the above removal order. Ensure you fit the clip and ball lever first before bolting anything else down as otherwise it is a pain to fit without easy access. 7. Use small hammer to locate main clips holding cables down to base of the new unit or edge of large screw driver.